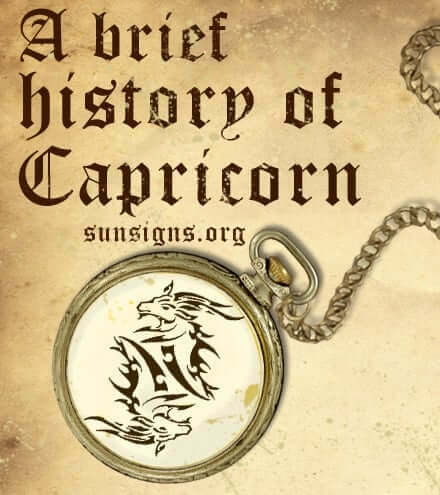 Those born between December 23 and January 20 are known as Capricorn, the tenth sign of the zodiac. Known for their steadfast natures and stubborn personalities, they are symbolized by the goat. Ruled by Saturn, the Roman mythological equivalent of Cronus, father of Zeus, this sign is very strict indeed. In Greek mythology, the constellation is sometimes called Amalthea. This was the being that was considered a foster mother of sorts to the infant Zeus for providing him with goat’s milk, after Rhea, Zeus’s mother, protected Zeus from being eaten by Cronus. Others say Capricornus refers to Pan, the god with a goat’s head. The goat’s horn is also known as the cornucopia or horn of plenty. The Capricorn star sign has earth element and the cardinal modality. Capricorn falls at the beginning of winter, when the temperatures are dropping and the harsh weather is setting in. Those dealing with the transition must be active, hearty and resolute in their actions. So too is the person born under the Capricorn zodiac sign. They are ambitious, determined, and stubborn as a goat. They will do whatever it takes to get the job done, and they don’t let anyone or anything stand in their way. It is a tough season to be born into, but they are tough people to cope with it. Other astrology traits have become associated with Capricorns over the years, including the knees, bones and skeleton for anatomy, lead for the metal, and brown for the color. The skeleton is what holds up the body and its rigidity perfectly represents the solid nature of those born under this sign. Lead is a highly dense metal and sturdy, while brown represents the color of the earth once all of the fall leaves have blown away. It is a desolate scene and a stark landscape, but one that people will work hard to get through so they can get back to the spring. Of course, they know they still have two more months to go, which is why they are so determined to make the best of their situation. With such a deep dark history, it’s easy to see why the Sea Goat are seen as the most serious of the zodiac signs. And their dry sense of humor matches the dry lands of winter before the snow falls. But if you want to survive a tough situation, go with a Capricorn!